Trust the Ares full-body case to provide your iPhone X (will not fit iPhone 8/8 Plus) the 360 degree defense you desire. A clear back panel offers an anti-scratch barrier while allowing wireless charging abilities. 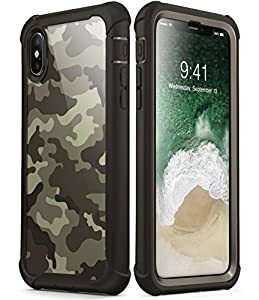 This protective clear case likewise features a touch delicate screen cover that conserves you the trouble of locating and installing a compatible screen protector and its fortified TPU bumpers resist damage triggered by impact. Full-body case with 360 degree protection Integrated touch-compatible screen cover eliminates the need for tricky installations Clear case with slim profile is easy to slip in and out of pockets and bags Fortified wraparound bumper made of shock-absorbent TPU materials Compatible with Apple iPhone X (2017) ONLY. Will not fit iPhone 8/8 Plus.